This is near and dear, to put it lightly. As many/most know, our close friend, Nikki Breedlove, came to within an inch of life when she was hit by a car in New York in February. For nearly a month, she fought in the ICU to regain consciousness, her memory, and the physical strength to overcome her injuries, which included massive head trauma, a collapsed lung, internal bleeding, a broken pelvis, and a crushed left leg. Somehow, true to form, Nikki's on her way to a full recovery. 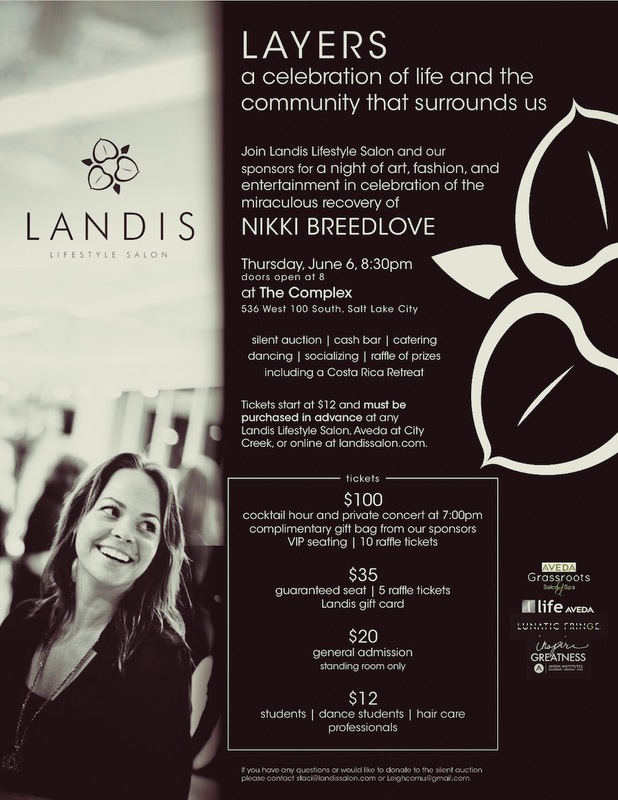 And naturally, since we know our people to be of the very best kind, a group of friends has joined forces to create an event that will celebrate life and aid Nikki in the costs of her recovery process: LAYERS. The evening will start at 7pm with cocktail hour and a private concert for VIP ticket holders, and 8pm for the general public. The hair/fashion/music/dance show will be accompanied by a cash bar, catering, a silent auction, and some insanely-desirable prizes, thanks to some generous sponsors -- think gift cards to a myriad of local spots, a night at Solitude Resort, a weekend home for 12-15 in Moab, and a yoga retreat in Costa Rica, to name a few. Seriously. Tickets to the show must be purchased in advance [due to liquor laws and the presence of a cash bar], so get on it. Just head to any Landis Lifestyle Salon, Aveda at City Creek, or hop online at landissalon.com. It's going to be a sensational show with some seriously good vibes. Get your tickets and see the magic people are capable of making when community breeds love. See Nikki's article in The Salt Lake Tribune here.